Students will estimate and mark fractional amounts using the edge of their desks as a linear measure and the top surface as an area measure. This task is best used after a solid understanding of number line has been established. 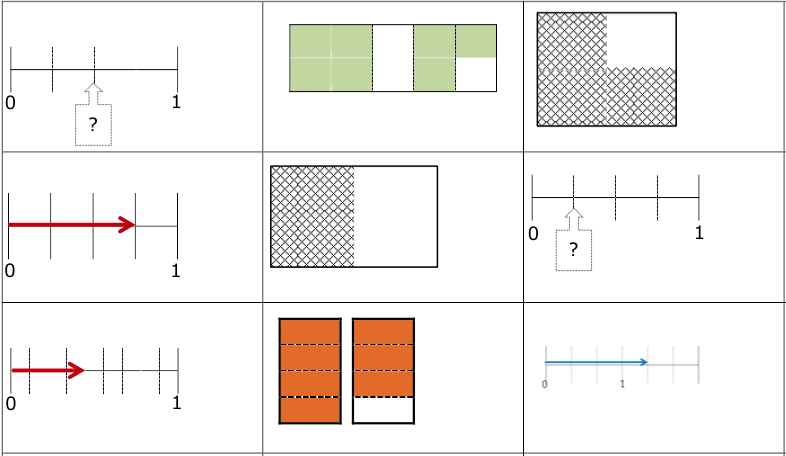 This task helps students connect linear models (number lines - which are recommended as an effective early model for building fractions understanding; see Unit A, Walk the Line), to area models (in this case, rectangular). Students locate fractions between 0 and 1 along the edge of their tables, and then extend that same fractional amount to cover an area of the desk top. It is important to think flexibly about different representations of the same fractions - not only equivalent fractions. In this case, also different models representing the same fractional quantity. 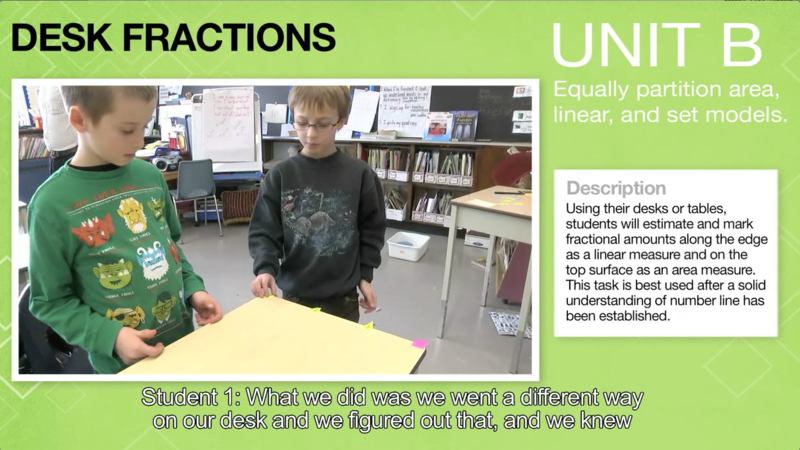 make connections between linear and area models and symbolic representations of fractions. Pair students and have them select a desk at which to work. Give each pair of students Fractions Set #1. Ask them to place 0 at the left edge of the desk and the 1 at the right edge of the desk. Discuss how the full length of the edge of the desk, which is being used as a number line, is one whole. Ask students to place Fractions Set #2 on the desk edge (number line) at the appropriate locations. Have students think about the area of the desktop. Ask students to cover one half of the desktop using a material of their choice. Discuss how the area of the top of the desk is an area model. Have students remove Set #2 and provide them with Fractions Set #3 to consider for both the linear and model models. on desk edge throughout task as benchmarks. benefit from repetition of the connection between number line and area with prompting and discussion. How can both of these (linear and area representations) be showing the same fraction? How is the linear model the same as the area model? How is it different? How do you know that your cards are a match? To download a copy of this .pdf, click here.